Horde Hunters is a melee-inspired form of Invasion, and it comes with all new custom Chaos “monsters”. A large horde of monsters is attacking the players, and the attacks will come in ‘waves’. The players will compete to see who is the best monster killer among them, given only melee weapons to start with. Points are awarded for each monster you kill, and the tougher the monster is to kill the more points you will get. Killing another player however, will cost you points. The object of the game of course is to be the player with the most points at the end of the match. 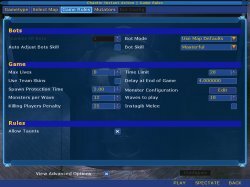 To start a game with the Chaos game types, you must first hit the ‘Community’ tab in the main UT2004 menu in order to load the Chaos mod, or use the custom ChaosUT2 desktop shortcut to start UT2004 with the Chaos mod already loaded. See the ‘starting chaos’ page of this manual for more details. 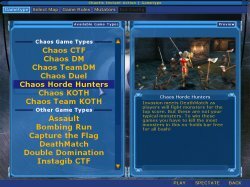 Once Chaos is loaded, and you’ve selected Instant Action from the main menu, you will see the game types menu, and from here you can select Chaos Horde Hunters. Horde Hunters is played on DM maps. So when you hit the Select Map tab all the DM maps that you have installed will automatically be displayed. 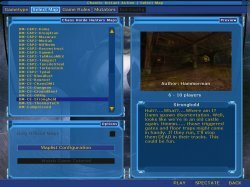 Select the map you wish to start with, set up a map list if you wish, and then proceed to the Game Rules tab as you would with any standard game type. 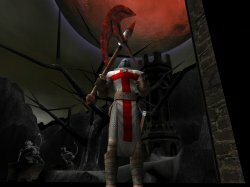 Max Lives – Limits the number of lives players have in each wave. So if you set this to ‘1’, then each player only get’s one chance, and as soon as they die they are out until the next wave. Set it at ‘2’ and they are out after their second death, and so on. ‘0’ = no limit, and players will respawn after every death. Waves to play – The hordes of monsters will attack in waves. This is how many waves you must defeat before winning the match. Instagib Melee – With Instabig melee weapons, it only takes one hit to get a kill. Monsters per Wave – Enter the number of monsters you want to appear in each attacking wave. Killing Players Penalty – The amount of points you will lose for killing another player (non-monster). Monster Configuration – Edit the types and relative frequency of monsters that appear in each wave. Help keep the proxies bouncing! Nothing's final! We're still piecing this together! © 2019 Chaotic Dreams - theme by Cyberhawk Designs.